It may be a bad day for fans of Olly Murs, but it’s a pretty exciting one for fans of irreverent movie rambling. 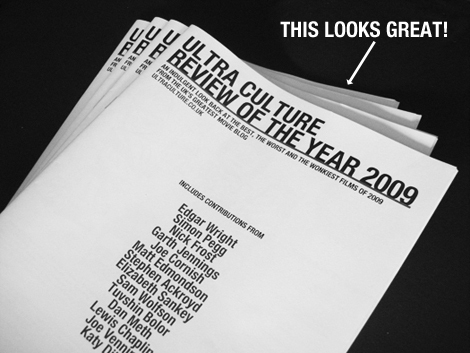 And that’s because Ultra Culture has released a 40-page Review of the Year zine, available now from our dedicated minisite at http://www.ultraculture.co.uk/2009 and from the BFI Southbank, London. It only costs £1 and it’s full of brilliant crap that you can’t get anywhere else (including our Top 10 Movies of 2009) so if you’ve been reading Ultra Culture for free for the last year and a half, you’re pretty much obligated to buy a copy. P.S. We really shouldn’t have published our Review of the Year on the same day that we’re going to see Avatar.